We have put together our largest update ever to celebrate our third anniversary. 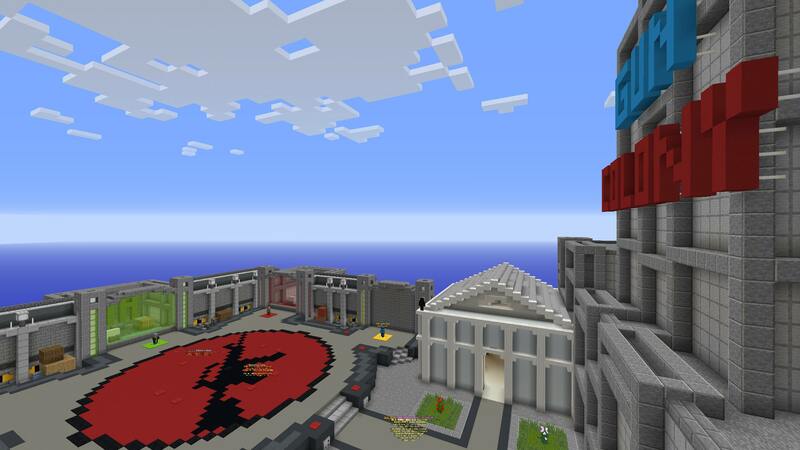 The update includes a new spawn, a new gamemode called Hostile, and various other changes to professionalize our server. Here I thank you for sticking with us through our third year – let’s make the next year even more amazing! 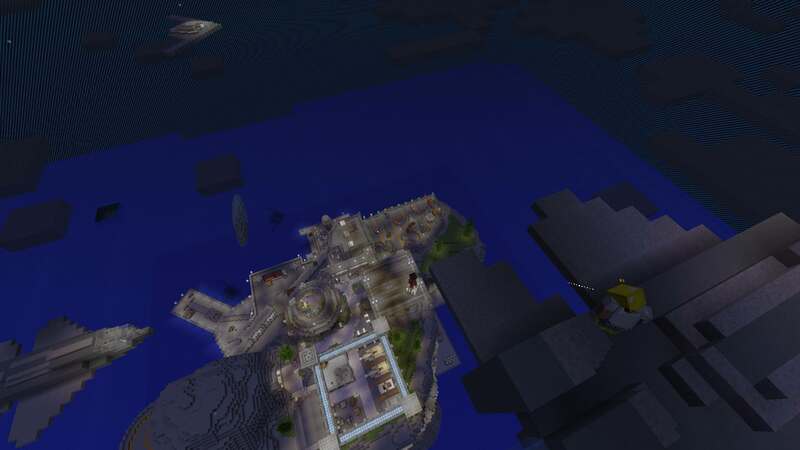 We have added a new spawn for the server. Now it not only has a more professional look, it is also larger and lighter on bandwidth (~80% bandwidth savings compared to the previous spawn design). This will help improve our new player impressions and increase accessibility and stability of the server. The new spawn also features NPCs. Right clicking them lets you join a lobby or customize your loadout quickly. We have updated the Minecraft server version to the latest, 1.12.2, and updated our plugins to work with the new version. Hostile is a new Kit-PVP gamemode that provides a unique open-world experience. Players jump down from a plane into a large map (currently the old spawn) to loot and fight. Every respawn players will be able to select a kit to bring into battle. Additional items can be obtained through the Supplies system in the Hostile menu. You can also move items freely in your inventory. Weapon stats are very different on Hostile compared to other gamemodes. Armor also works differently than vanilla and in the same way as Mob-Arena or Infected. Fall damage is disabled, but if you die, you (currently) drop everything, so be careful out there. We have changed the art of our server list and website – in case you haven’t noticed already! A new notification element displayed on the top right corner of the screen. It is activated when the bomb is planted or defused in Defusal, and when new waves begin and when bosses spawn in Mob-Arena. A new skull icon effect displayed below the crosshair. It is shown when your team wins a round in PVP, or if players defeat a boss in Mob-Arena. First and foremost you should notice that the Mob-Arena lobby is now set during the day. After a game begins, it will stay day if on Easy mode, but a new animation will play turning it gradually into night on Hard mode. Why did we have to do that? Actually, we also decided to ramp up the difficulty of Mob-Arena Hard mode by a lot, and add some new mobs from 1.11 and 1.12. So we added the weather changes so you are properly warned and won’t get spit to death by llamas in Wave 1! Fixed a rounding error that caused too few mobs to spawn. The result is that a lot more mobs should spawn than before, especially with a low number of players. We have changed the display names of many weapons to be more realistic. Notable changes include “AWP”->”AWM”, “PP-Bizon”->”PP-19 Bizon”, and “Type 92″->”QSZ-92”, but there are many other changes. We have differentiated weapon penetration values based on their caliber. Larger caliber weapons can now penetrate objects better than before, while smaller caliber weapons might perform a bit worse. We have done another round of balance changes to improve our weapon balance. Details can be found on our forum post. Most notably we have totally overhauled the M40A1. It is now much cheaper and handles better, but its damage has been reduced greatly to put it in line with other 7.62x51mm weapons such as the M24. Also, the SR-3M was reworked to have much less damage but better accuracy. A handy improvement to Defusal. The “bomb dropped” message now also displays when a player drops the bomb voluntarily. We have simplified the process of leaving a game and added a reminder for players to use the leave commands. Added an auto-leave timer of 10 seconds after a match of Mob-Arena ends. /channel global: Global channel. Chat with everyone else and Discord. /channel server: Server channel. Chat with players on the same server. If you are on GunColony, Hostile players won’t hear you. /channel map: Map channel. Chat with everyone within a 500 block range. This generally means that they have to be in the same map in order to hear you. The server now uses the “Reduced Debug Info” gamerule. This causes F3+B hitboxes to no longer work, helping us enforce the rules and provide a fairer play environment. For details please view the patch notes in our forums. We have fixed 9 major and minor issues in our server. For details please view the patch notes.